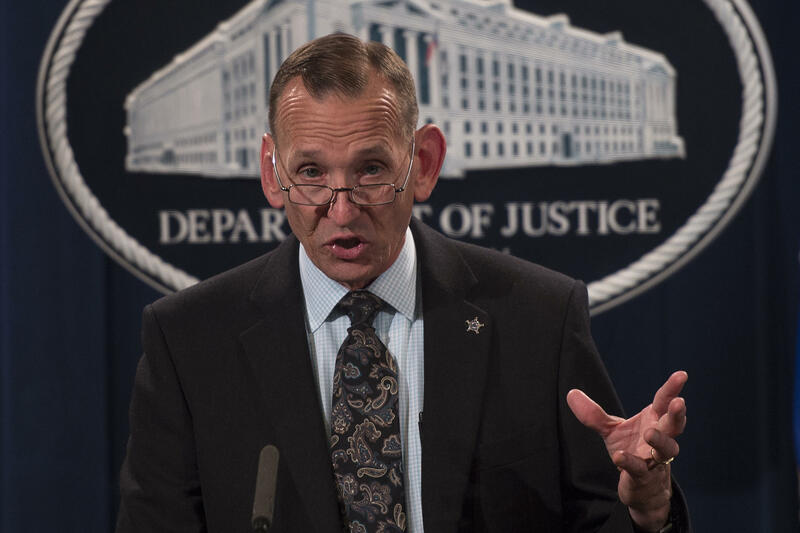 Director of the US Secret Service Randolph Alles speaks at the Justice Department last year. President Trump announced on Monday that Alles will be replaced. In a statement, White House Press Secretary Sarah Sanders said Alles "has done a great job at the agency" and would be stepping down shortly to be replaced by James M. Murray, a career Secret Service member, who will start in May. His ouster comes after a Chinese woman carrying a thumb drive infected with malware talked her way into Mar-a-Lago, the president's club in Palm Beach, Fla., while the president was nearby. She was stopped only after telling a reception desk attendant she was at the club to attend a nonexistent function. It was not immediately clear whether Alles' departure is connected to that incident. After it happened, Trump defended the service's actions, saying: "I could not be happier with Secret Service. Secret Service has done a fantastic job from day one. Very happy with them."